This bundle is a curated offering of many of my most popular fonts over the years. I wanted to include a little bit of every style, to give designers a well rounded arsenal of fonts. Modern, vintage, script, marker, handwritten etc... every style is covered! Get a download link as soon as you make your purchase, so that you’re ready to go immediately without any wait or hassle. This bundle gives designers a very versatile range of font offerings. Whatever project is thrown your way, there’s a font here for it. Get all 104 of these fonts in 26 typefaces for only $34. The discount here is so huge, that if you've ever thought of buying even just two of my typefaces, you might as well get all of these for around the same price. Please note that two of the font families (Hunters and Take Charge) are premium Opentype SVG fonts. These are built to work in newer versions of Photoshop and Illustrator. Click on their respective links below to learn more about requirements for these typefaces. 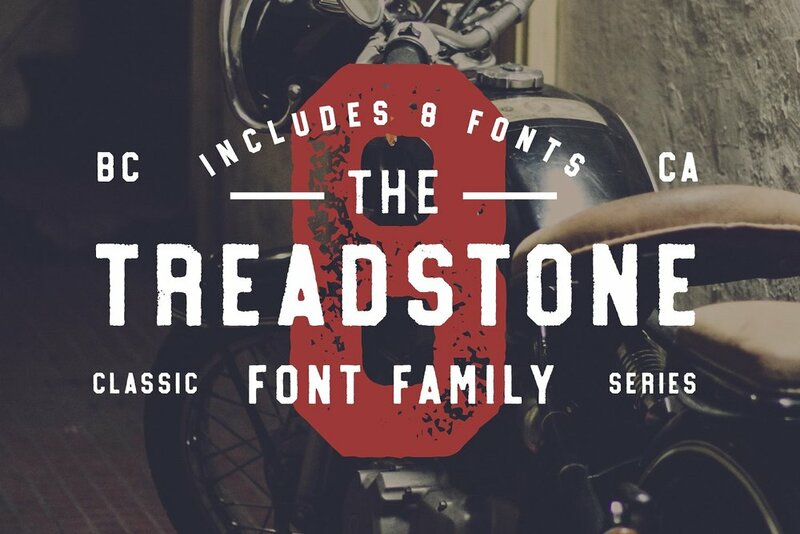 Treadstone is a family of EIGHT fonts that give a modern twist on a classic look. This font family includes versions with rounded edges, rough edges and grunge effects, each of which has its own character and charm. Treadstone works great for headlines, titles and logos. Sunfast is an edgy, rough font with tons of character and earthy vibes. Every character in this font was hand painted to give a completely authentic look. Sunfast works especially well for logos, quotes, apparel, advertising, image overlays, greeting cards and web banners. 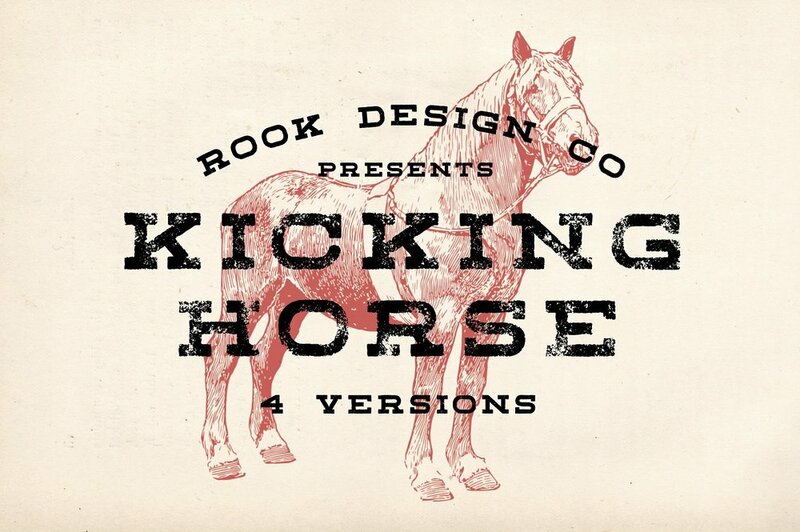 Kicking Horse is a family of FOUR slab serif fonts designed with a vintage print look in mind. Rounded edges and textures were added in to give a weathered, western vibe. 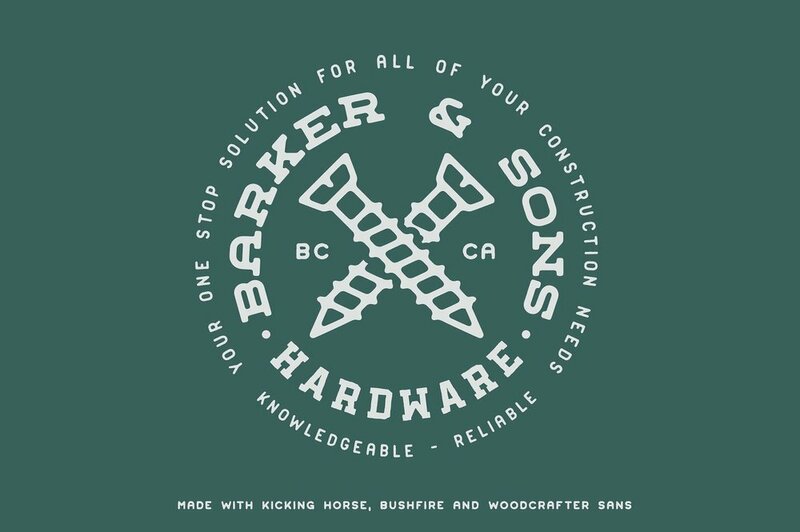 Kicking Horse works great for logos, text blocks and everything in between. The characters in Kicking Horse are wider than your average font, which is great for a well rounded font arsenal. Effortlessly take your branding to the next level with Something Fresh. Something Fresh is a playful handwritten font family, full of personality and curves. This font was designed using quick strokes to create natural brush textures, to give the font a natural look in a digital world. Try using Something Fresh for logos, branding, social media, product packaging, wedding branding and advertisements. 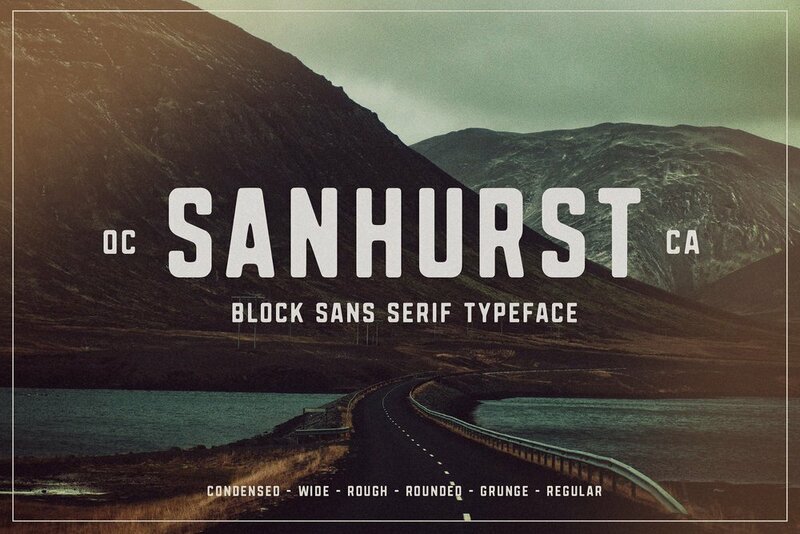 Sanhurst is a versatile family of fonts designed for strong, classic branding. Rounded, rough and grunge versions are included to give your design a little more of a retro printed look while the regular versions are great for a more modern, digital look. The edges of the characters are a lot more 'boxy' than your average font which gives off a strong, industrial feel. Sanhurst works fantastic for website headers, clothing designs, magazine advertisements, logos, branding and much more. 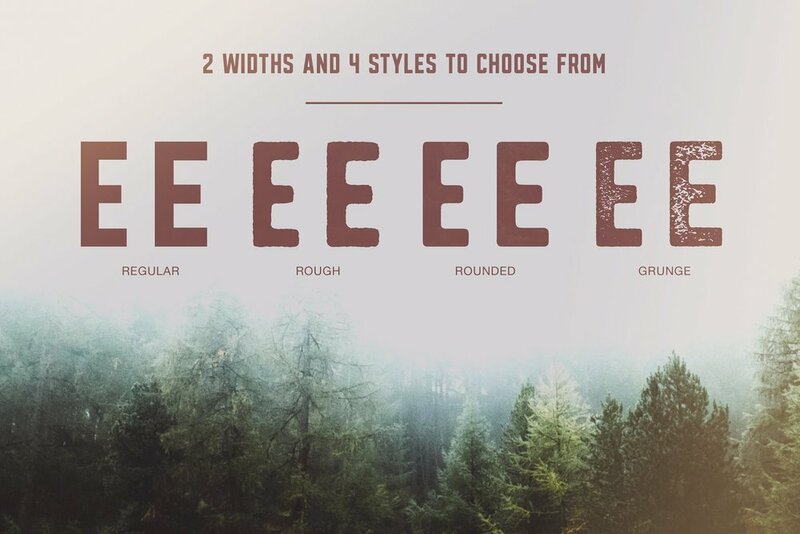 This font was inspired by the spirit of the outdoors, with a little bit of grit in mind. Mount Baker is perfect for logos, branding and personal signatures. Included in the font pack are also 26 underline swashes, to give your piece a little extra boost. One for each letter to make things easy to use! Postmark is an elegant typeface, perfect for weddings, invitations, quotes, logos and branding. The font comes with alternate lettering for all lowercase characters, to give you more versatility when creating your graphic. 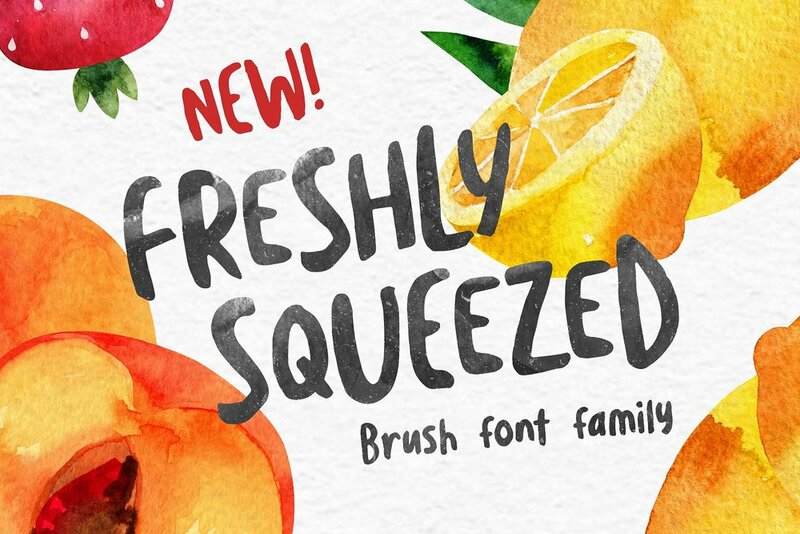 Freshly Squeezed is a font that projects a ton of light hearted personality. Whether the characters are used for logos, greeting cards, book covers, banners or flyers, these bouncy letters are perfect for lightening the mood. Each character was handpainted and refined, until everything mixed together perfectly. If you’re looking for variety in your text, look no further. Every letter a-z has an alternate character available. This gives you options to work with, and keeps your text looking natural. To add even more personality, we’ve added in an extras font full of fun swashes, icons, and other images that can help spice up your designs. As the title suggests, this font was created with boldness in mind. It is built to grab peoples attention, and add nice character and flair to your design. Everything in the font was hand drawn. Bold Vision works especially well for advertisements, logos, quotes, image overlays, apparel and web banners. Looking for an elegant font to class up the place? Maybe you have some wedding invitations that you've been putting off for a month, because you haven't found the perfect fit. Maybe you just want to have another awesome font in your design arsenal that makes designing a breeze. 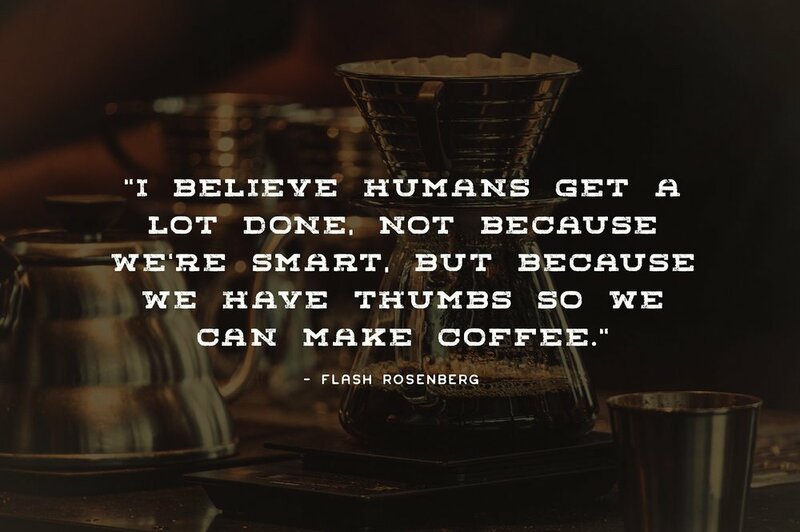 Either way, I have just the thing for you! This font family works great for fashion, weddings and other high end applications. Belmont features over 54 ligatures and a full set of alternates which keeps the text very natural looking and gives you tons of variety to work with. Try this font out for signatures, mottos, instagram posts, web banners and much more. Introducing Outshine. A fun, bouncy font duo with handwritten dry strokes. A ridiculous amount of time was put into making this font perfectly imperfect, and getting the flow just right. You get two font files, for lots of versatility. Outshine is ideal font for text overlays as well as branding/logos and product packaging. Use the two font files in combination for outstanding results. Try mixing different combinations of uppercase and lowercase characters to get the perfect mix you're looking for. Take Charge is a font that goes above and beyond a typical font. Using OpenType-SVG technology, this font preserves all of the detail of the original hand painted letters. It truly looks realistic, and the difference compared to regular vector fonts is staggering. 285 characters were hand painted dozens of times in order to get the perfect results. It works fantastic for banners, quotes, social media posts, book covers, magazine ads and all sorts of branding. Take Charge and buy this font today! Westmount is a geometric sans font that is both versatile and contemporary. The wide spacing between letters gives your text room to breathe and have the perfect amount of presence and balance. The strong capital letters are perfect for clean layouts and timeless branding. Try using Westmount Outline for a unique classic look. Woodcrafter Sans is a family of FOUR fonts designed with your logos, branding, and quotes mind. Rounded edges and imperfections were added to the characters to give that old school printing vibe. Woodcrafter Sans is extremely versatile on its own. The font family also works great as a secondary font to go along with existing logos and branding. Introducing Wellaway, a signature font with some grit and character. Each character in this font was hand drawn to give an organic feel and maintain authenticity. Wellaway works especially well for logos, quotes, apparel, advertising, image overlays, greeting cards and web banners. Tofino is a family of two fonts, designed to work harmoniously. Both have rounded, imperfect edges to give the font more of an organic feel. A great deal of time was spent getting each letter perfect, along with kerning and adding special characters. Tofino works great for large titles, as well as small text. It works great for posters and web banners, and compliments other fonts quite well.